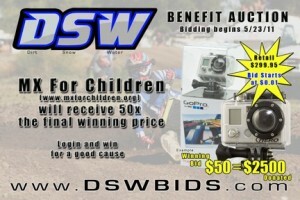 MX for Children has been selected as the beneficiary for the inaugural auction of new penny bid site DSWbids.com. DSW is short for Dirt, Snow and Water. They contacted us on a recommendation from Brian Barnes saying that they were going to launch their new site at the outdoor season opener at Hangtown and they were looking for a good charity to benefit. Penny bid auction sites give you an opportunity to get great gear for substantially less than retail prices. DSWBids first auction is for a GoPro Helmet cam and they are going to donate to MX for Children 10 times the selling price of the camera. So if you want one of these cameras and you like MX for Children, go to www.dswbids.com and bid on the camera! Thanks Brian for the referral and thanks to everyone that bids! This entry was written by admin, posted on May 20, 2011 at 4:03 pm, filed under MX Charity Auctions, News. Bookmark the permalink. Follow any comments here with the RSS feed for this post. Post a comment or leave a trackback: Trackback URL.